Esto es un uno-de-una especie de ultra-moderno, completamente amueblado, un dormitorio con balcón de cuerpo entero en el piso 39, mirando hacia el sur hacia el American Airlines Arena, Bayside y el hermoso centro de Miami horizonte. Al salir a la terraza que tiene vistas panorámicas de la Intracoastal Waterway y de South Beach. Actualicé el condominio con un ambiente influenciado por Miami: pisos de terrazo, techos flotantes, iluminación de cuerdas, todas las puertas y marcos hechos a medida, muebles de pared, gabinetes a medida en armarios. Para ayudarlo a disfrutar de su estadía, la cocina tiene todo lo que necesita para la preparación de alimentos, incluida una cafetera, licuadora, tostadora, etc. Cuando estés listo para relajarte en el sofá de cuero, que también es una cama plegable extra grande, puedes escuchar música a través del altavoz Bluetooth, ver la televisión por cable o transmitir contenido a través del wifi rápido. El mundialmente famoso Lincoln Road y South Beach están a sólo cinco minutos. Brian's place is awesome. He has thought of everything. The pictures do not do this place justice. Super clean. the bed is very comfortable. A washer and dryer! A kitchen with everything you need to make meals. Two beautiful Sony TV's. A deck that overlooks Miami. It was an amazing stay, and I would stay here again. This location is AWESOME! Brian is phenomenal to work with and makes the process seamless and easy. CLEAN!! The decor is just as pictured online and the view is simply fantastic. Easy to move around downtown and a Publix market is a short 2 blocks away. Parking is available and the amenities are as advertised. I stayed here in 2014 and it has been well maintained. I appreciated Brian's hospitality! We were in downtown Miami for a month. Free Metro was good for getting around downtown but Uber or Lyft is best for getting to South Beach as parking can be expensive, hard to find and traffic is heavy. Many great sites like The Brickell Center and Lincoln Road Mall with a ton of places to eat. Wynwood is a new district with a bustling nightlife but not exactly in downtown. Beware of the spring breakers if coming in late February or all of March, especially in South Beach. 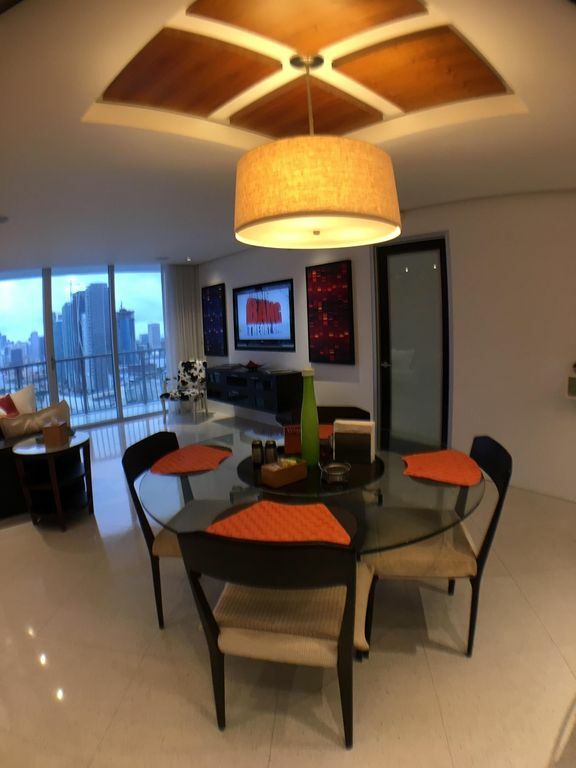 The condo is aesthetically a delight, spacious and with an amazing view from the 39th floor, completely equipped with everything you need for your stay. Brian generously left fresh fruit for us as well as butter, cream, coffee, and much more. An excellent supermarket is a block away and the free Metromover and the Arsht center are also nearby. We hope to come back. Great location, clean, convenient, safe. Everything you need for a pleasant stay. The view from the balcony is awesome. Brian is very friendly and helpful. Communication with Brian was great. It was wonderful to meet him as we checked in & for him to show us everything in this fabulous condo. His welcome gifts were so sweet & delicious. If you have a car, which really isn’t necessary unless you plan to drive to out of the way places, there is a designated parking spot just for you. Enter Brian’s condo & immediately you are swept away by the breathtaking view from the living room & bedroom floor to ceiling sliding glass doors. The furnishings are more than you could want in comfort, style & so beautifully done. The bed is extremely comfortable & the bedroom’s window darkening shades indicate just what a high end unit Brian has created. The lighting is amazing with lights for reading, atmosphere & general all around comfort. The light switches being marked eliminated any question as to what turned on what. With a washer/dryer inside, you can even go home with a suitcase full of clean clothes. We’re already looking for a return trip to Miami & without a doubt, Brian’s condo in the Opera Tower is the place we want to be. Cerca de los estadios de Miami Heat, Marlins y Dolphins. Alquiler cercano de embarcaciones, jetskis, flyboards. Ir a pescar en alta mar desde el puerto deportivo cercano. Hay peluquería, empresas de tintorería en el edificio y también un restaurante de tapas español y japonés; Otros restaurantes cercanos. Paseos en bote a una corta distancia. Cancellation requires a minimum 30 day notice. Following amenities are free: gym, sauna, pool, parking space, wifi.